Jean-Baptiste Perronneau (1715/16-1783), A Girl with a Kitten (c 1743), pastel on paper, 59.1 x 49.8 cm, The National Gallery (Presented by Sir Joseph Duveen, 1921), London. Image courtesy of and © The National Gallery, London. Until the advent of chemistry in the eighteenth century, the vast majority of pigments occurred in nature, even if the minerals or plant matter from which they were derived had to be specially processed. The first true synthetic pigment was in fact so ancient that it was forgotten completely in the Middle Ages: Egyptian Blue was first made before about 3000 BCE by heating together powdered limestone, malachite, and quartz sand, to form calcium copper silicate. But that was an exception. It wasn’t until the early years of the eighteenth century that a hydrated iron hexacyanoferrate complex known quickly as Prussian Blue was synthesized. No one knows who first made Prussian Blue, nor exactly when it was first synthesized. It seems to have appeared initially around 1704, and its origins have been attributed variously to Diesbach in Berlin, or Mak in Leipzig. For once its name is appropriate, as it was a product of the Prussian Empire. Its potential as a colourant was recognised by 1710 when it went on sale in Berlin, and by about 1724 it was being manufactured in several countries across Europe. Adriaen van der Werff (1659-1722) and Henrik van Limborch (1681-1759), Jacob Blessing the Sons of Joseph (before 1722-28), oil on panel, 61.1 x 47.5 cm, Allen Memorial Art Museum (Mrs. F. F. Prentiss Fund, 1963), Oberlin, OH. . Courtesy of the Allen Memorial Art Museum. 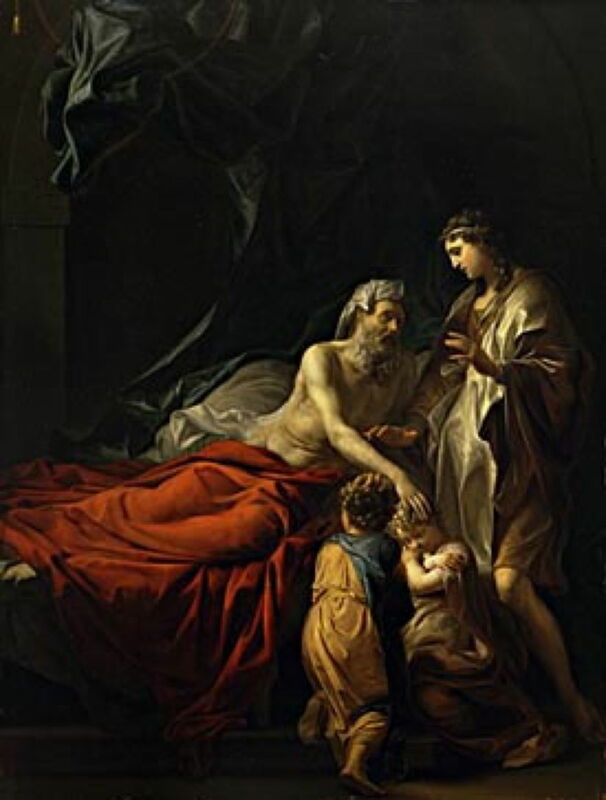 Among the very first surviving oil paintings to use Prussian Blue is that by Adriaen van der Werff and Henrik van Limborch, of Jacob Blessing the Sons of Joseph. This was started by van der Werff before he died in 1722, and the blue paint is thought to have been applied by him to the curtain at the upper left; it is that paint which has been shown to contain Prussian Blue. After van der Werff’s death, his pupil Henrik van Limborch finished the work between 1727-28. 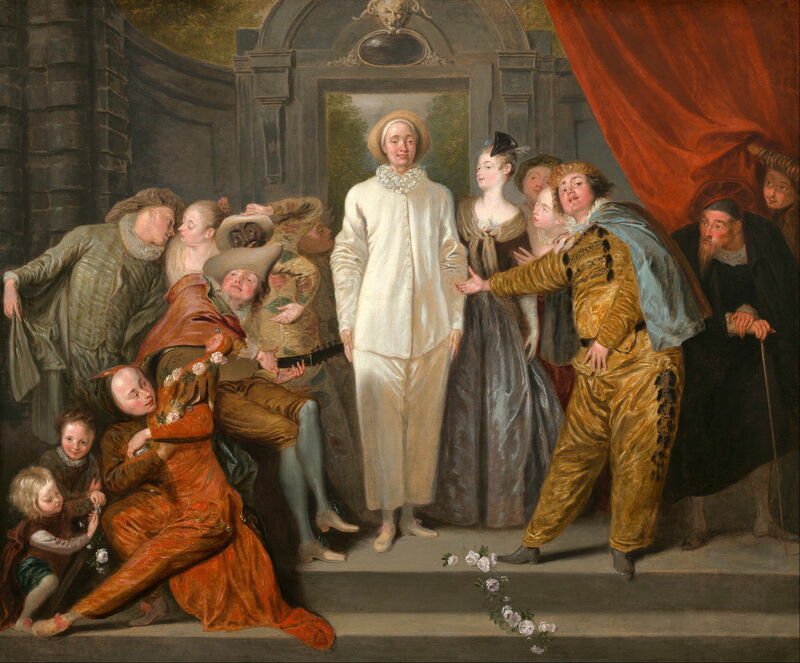 Antoine Watteau (1684–1721), The Italian Comedians (c 1720), oil on canvas, 63.8 x 76.2 cm, National Gallery of Art, Washington, DC. Wikimedia Commons. Another early example of the proven use of Prussian Blue is Antoine Watteau’s The Italian Comedians from about 1720. Canaletto (1697–1768) (attr), Grand Canal from Palazzo Balbi toward the Rialto (1720-23), oil on canvas, 144 x 207 cm, Ca’ Rezzonico, Venice, Italy. Wikimedia Commons. 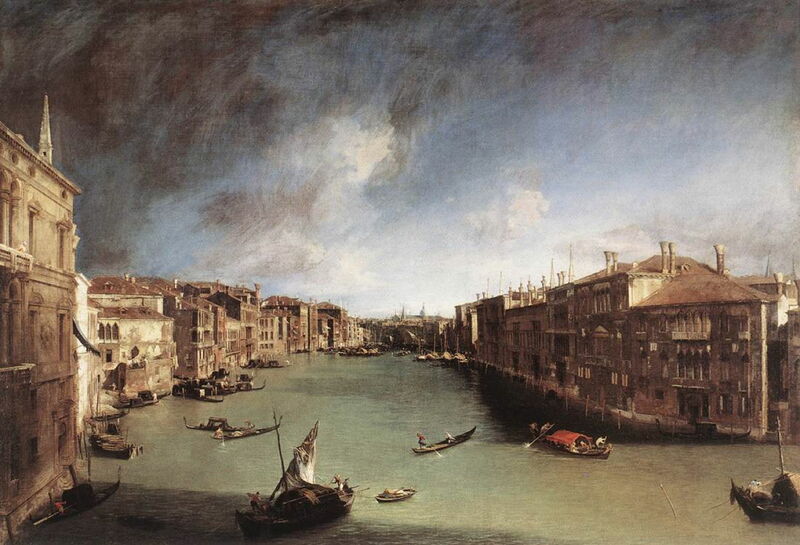 Canaletto is one of the first Masters to have used Prussian Blue extensively. 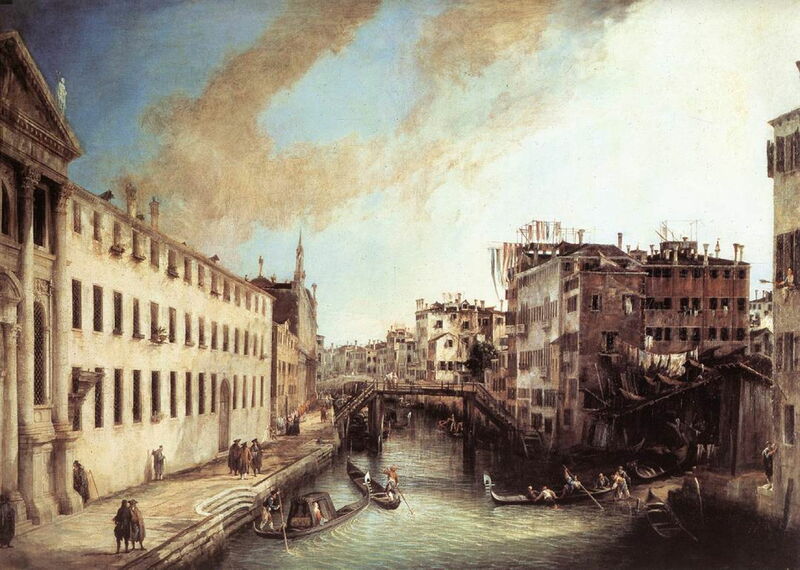 Grand Canal from Palazzo Balbi toward the Rialto from 1720-23 has been attributed to him as one of his earliest surviving works, and its blues have been found to contain Prussian Blue. Canaletto (1697–1768), Rio dei Mendicanti (1723-24), oil on canvas, 143 x 200 cm, Ca’ Rezzonico, Venice, Italy. Wikimedia Commons. Canaletto was quickly using the pigment in almost all his paintings, including this view of the Rio dei Mendicanti from 1723-24, above, and his famous The Stonemason’s Yard (c 1725), below. 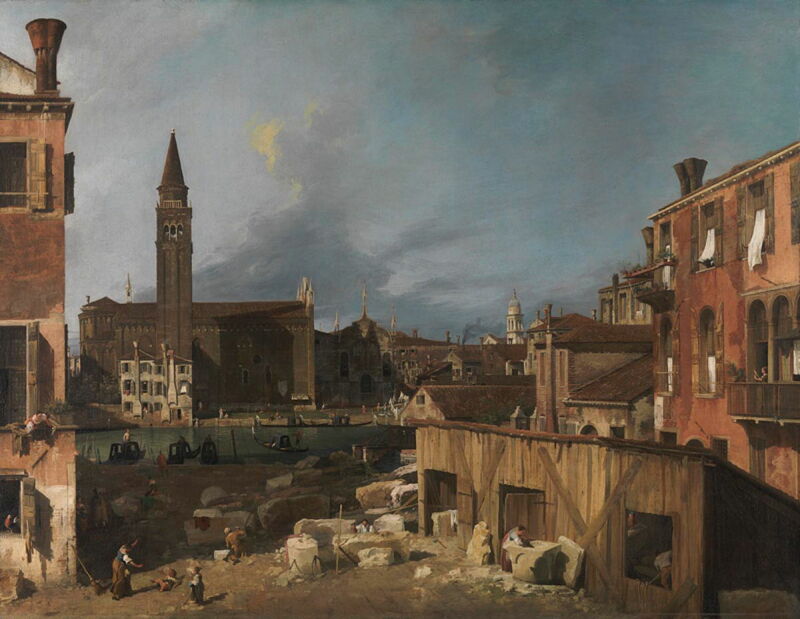 Canaletto (Giovanni Antonio Canal) (1697–1768), Campo S. Vidal and Santa Maria della Carità (‘The Stonemason’s Yard’) (c 1725), oil on canvas, 123.8 x 162.9 cm, The National Gallery (Sir George Beaumont Gift, 1823), London. Image courtesy of and © The National Gallery, London. As experience was gained in using this pigment, it became the subject of controversy. Some artists were confident that its colour was stable and did not change or fade, but others experienced problems as bad as or even worse than those of Indigo Blue, which it had generally replaced. It has gradually become understood that adverse results of lightfastness testing (and experience in paintings) have depended on the mixture of Prussian Blue with other colours, particularly with white paint, and the presence of impurities in the pigment itself. 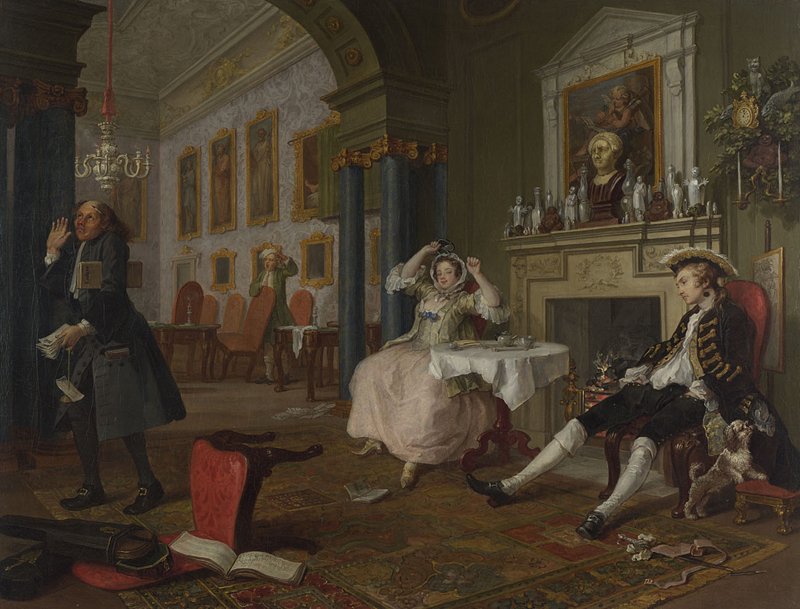 William Hogarth (1697–1764), Marriage A-la-Mode: 2, The Tête à Tête (c 1743), oil on canvas, 69.9 × 90.8 cm, The National Gallery, London. Courtesy of The National Gallery London, inventory NG114. By the middle of the eighteenth century, Prussian Blue was widely used in a range of binding media, with the exception of fresco and other alkaline media with which it proved incompatible. William Hogarth’s paintings in his Marriage A-la-Mode series have been found to contain both Smalt and Prussian Blue. 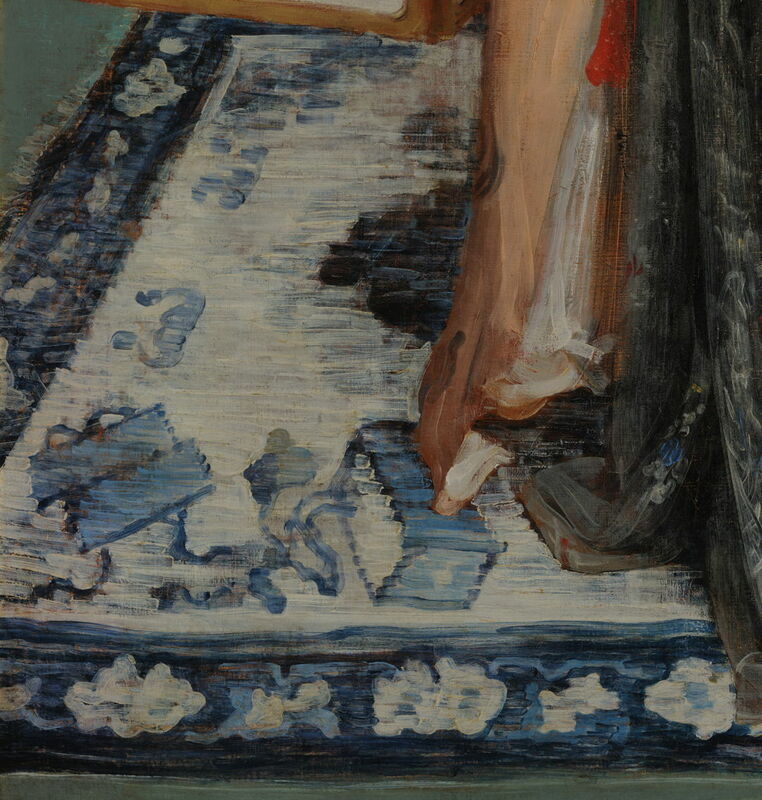 In The Tête à Tête (c 1743), Smalt has been found in the ornate carpet, and I suspect that the ornamental pillars behind the woman rely on Prussian Blue, at least in part. Hogarth trained as Prussian Blue came to the ascendant, and wouldn’t have painted much before it became widely available. 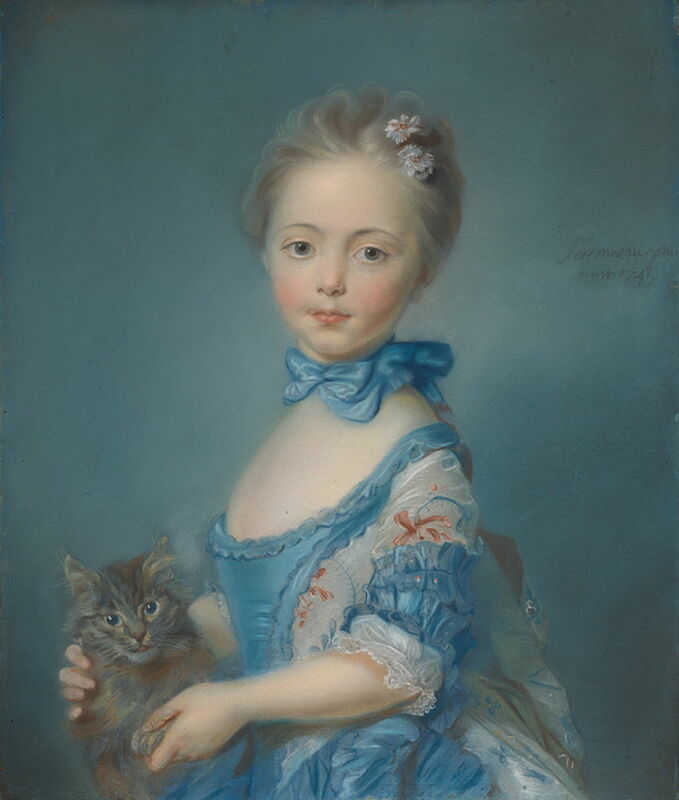 Jean-Baptiste Perronneau’s A Girl with a Kitten from about 1743 is a fine example of the use of Prussian Blue in pastels: the girl’s blue dress and the background have both been found to contain the pigment. William Blake (1757-1827), Lucia Carrying Dante in his Sleep (from Dante’s “Divine Comedy”) (1824-27), watercolour, black ink, graphite, and black chalk on off-white antique laid paper, 37.2 x 52.2 cm, Harvard Art Museums/Fogg Museum (Bequest of Grenville L. Winthrop), Cambridge, MA. Courtesy of Harvard Art Museums/Fogg Museum. Prussian Blue also became popular in water-based media. 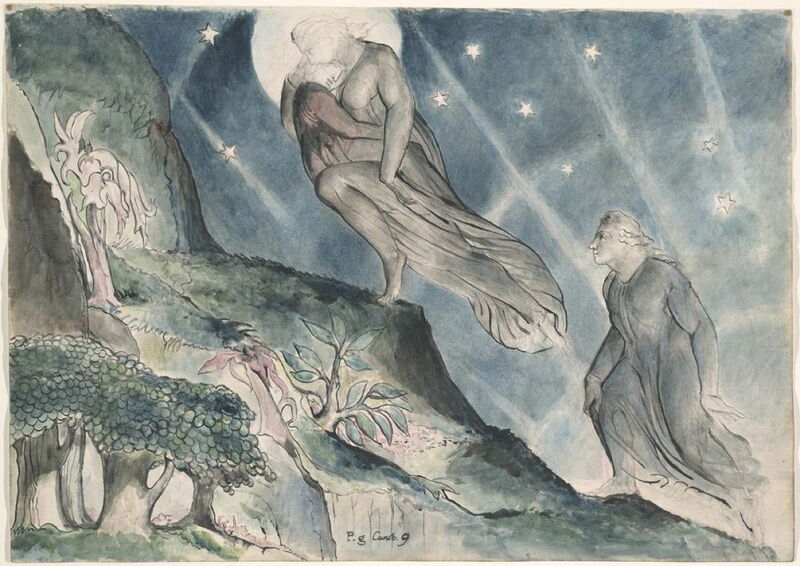 William Blake’s Lucia Carrying Dante in his Sleep, from series depicting Dante’s Divine Comedy painted in watercolour between 1824-27, is a good example. In this and several other of his paintings, Blake used the pigment on its own and mixed with Gamboge as what was known as Prussian Green. 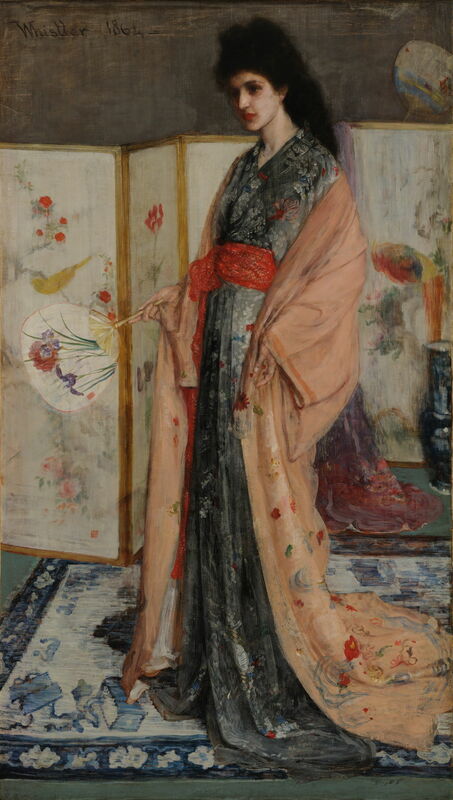 James Abbott McNeill Whistler (1834–1903), The Princess from the Land of Porcelain (1863-65), oil on canvas, dimensions not known, Freer Gallery of Art, Smithsonian Institution, Washington, DC. Wikimedia Commons. Prussian Blue pigment has been found in the blue passages in Whistler’s The Princess from the Land of Porcelain (1863-65), from his Peacock Room, shown above and in the detail below. James Abbott McNeill Whistler (1834–1903), The Princess from the Land of Porcelain (detail) (1863-65), oil on canvas, dimensions not known, Freer Gallery of Art, Smithsonian Institution, Washington, DC. Wikimedia Commons. The use of different blue pigments varied markedly among the French Impressionists and their successors. Paul Cézanne and Georges Seurat appear to have used Prussian Blue seldom, if at all, but it is well known in the work of Edgar Degas, Claude Monet, and Vincent van Gogh. 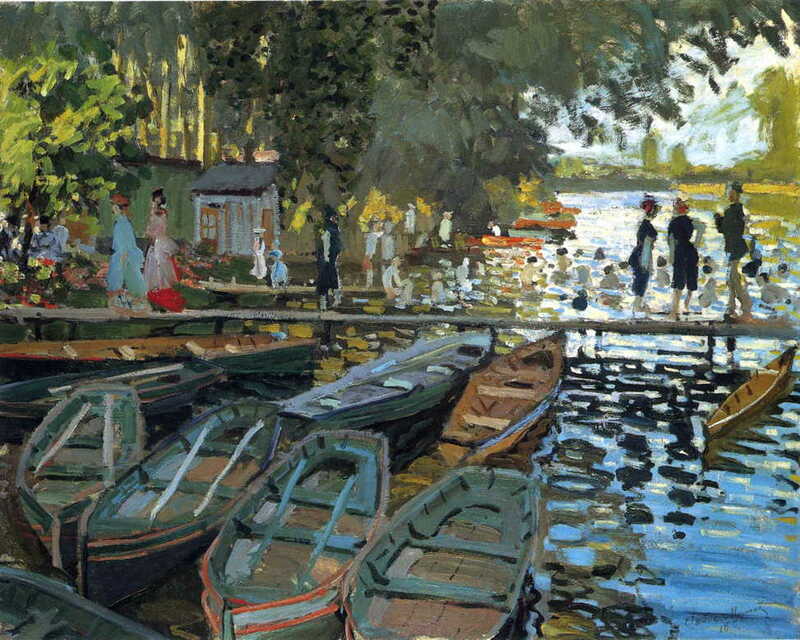 Although Claude Monet’s Bathers at la Grenouillère (1869) contains Cobalt Blue in the brighter mid-blues of the water surface and details in the boats, darker blues towards the left, and in the clothing of some of the figures and their reflections, are almost certainly Prussian Blue. Vincent van Gogh (1853-1890), La Mousmé (1888), oil on canvas, 73.3 x 60.3 cm, The National Gallery of Art (Chester Dale Collection), Washington, DC. Courtesy of The National Gallery of Art. Vincent van Gogh’s portrait of La Mousmé from 1888 illustrates some of the difficulties of identifying pigment use. (Its title is derived from the Japanese word musume, meaning girl; at the time the French word was understood to mean an ‘easy’ girl.) Infra-red images demonstrate the use of at least two different blues, one of which has been identified as Prussian Blue. The two (or more) blue pigments are not distributed at all evenly: on the girl’s jacket, the three blue stripes to the left of the row of buttons contain the most Prussian Blue, while the three under her right armpit, which look darker blue, contain little or no Prussian Blue. 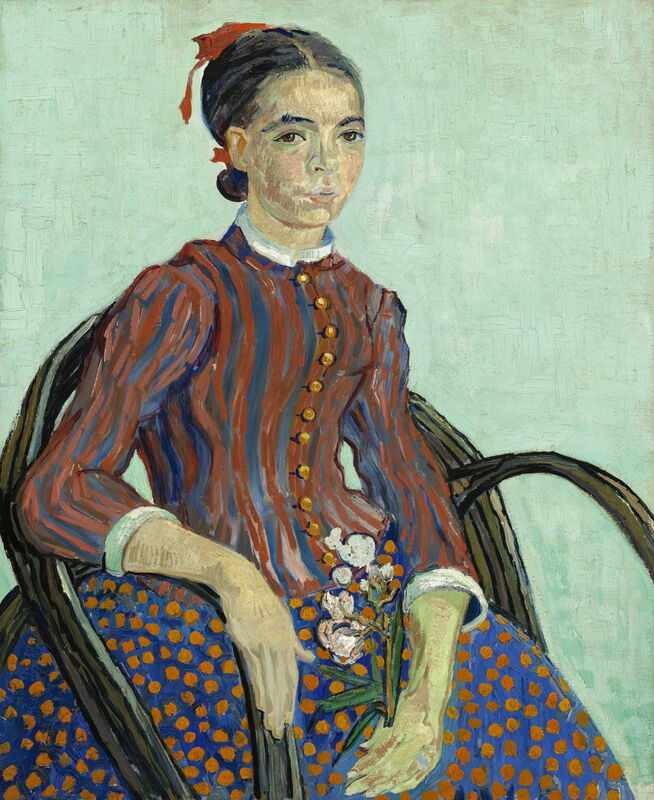 Van Gogh also mixed yellow with Prussian Blue to form the green of the flowers she holds in her hand. Prussian Blue remained a popular pigment in oil and watercolour paints well into the twentieth century, and is still offered in many commercial ranges. For many artists, though, it has been replaced by much more recent synthetic blue pigments, such as Phthalocyanine (‘Phthalo’) Blue, introduced around 1970. It is seldom used in Prussian Green now. Barbara H Berrie (1997) Artists’ Pigments, vol 3, ed Elisabeth West Fitzhugh, Archetype. ISBN 978 1 904982 76 0. Posted in General, Life, Painting, Technology and tagged artists paints, Blake, Canaletto, history of painting, Hogarth, Monet, painting, Perronneau, pigments, van der Werff, van Gogh, Watteau, Whistler. Bookmark the permalink.